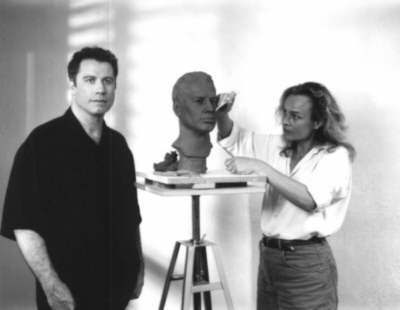 It was a great honour and a fantastic experience having John Travolta pose for me for his bronze bust in the context of my "20 Heads of the Year 2000" project to benefit a community-oriented organisation, The World Literacy Crusade. John Travolta is involved in many projects to benefit youth and he is always seeking out means to promote "Study Technology" - a breakthrough in education developed by L. Ron Hubbard, used by teachers in private and public schhols, learning centres, tutoring projects and community programs throughout the USA and in 30 countries around the world - as well as by The World Literacy Crusade as a tool to effectively combat illiteracy. Contact me for donations to the project or further information. Only the clay is shown here - though after the bust was finished and approved by John, it was cast in bronze. You can commission me today for a lifesize portrait or bust - on a private basis or for a charity or corporate project, and I'll be on my way as soon as we have worked out a mutually agreed date for the first sitting! Prices for a lifesize portrait or bust on request- includes original artwork, the finished lifesize bronze only. Artwork prices will not include travel expenses (which may be minimal depending on where I am), base (can be slate, marble, wood, or bronze to suit the sculpture) or costs of shipping the bronze to you when cast. Charities will benefit from important reductions in fees.